Passions are like some hard [dark] substances that, standing in the midst between the light and vision, prevent the latter from discerning the difference of things. St. Isaac likens this noetic or spiritual vision to physical sight. Just as there are many factors that either enable or interfere with one’s ability to see things with the physical eyes, so there are many factors that influence our ability to see spiritually–what St. Isaac calls discernment. The two essential factors in spiritual sight, or discernment, are a sound mind (nous) and Grace, which is “the sun that enables discernment.” I cannot help associating “sound mind” with 2 Timothy 1:7 “For God has not given us a spirit of fear, but of power, love and a sound mind (or self-control, sofronismos). A sound mind, a healthy mind, is one that is under control. Bringing our minds under control is healing our minds–it’s the same thing. But if our minds continually wander and are easily caught up in arguments and “high things”(c.f. 2 Cor. 10:5 and Psalm 131:1), then no matter how much God shines His Grace upon us, our spiritual sight, or discernment, will be corrupt, fuzzy, and just plain wrong–like a blind man in full sunlight trying to guess the colour of the flower he smells. Riches here refer to the Grace of God, but stinginess, what can that be referring to? After all, St. Isaac is a hermit writing to other hermits. I don’t think he is referring to sharing your grace-filled insights with others. In fact, I’m certain that is not what he is referring to because elsewhere he repeatedly exhorts his readers not to leave their cell on the pretext of edifying someone. What then can this stinginess be referring to? My best guess is that it is a reference to trying to save one’s own life (c.f. Matt. 16:25). When we try to save our life, we lose it. The riches of Grace are not comely for a person who is stingy with his or her life–trying to save it, not willing to lose what she or he thinks is important, not willing to die (spiritually) in secret, not willing to give up the delusion of control. It is not comely for God to pour out much Grace (spiritual light) on those who hang on to life in this world (as it is) in a stingy manner, not wanting to give this paltry worldly existence completely over to God, not willing to let go in their hearts. If this is what St. Isaac means, then no wonder I am so spiritually dense. I am nearly blind wandering by the light of a crescent moon and a few stars. Maybe the moon is the Theotokos, our Mother, shining with the reflected light of the Sun (Her Son), and the stars are the saints praying for us, the meandering ones. But even the crescent moon and the stars are enough light to walk a well-trodden path. It’s not enough light to see very far down the path or to see much of what’s off the path; but it is enough to put one foot in front of the other. I know this is true physically for I have hiked in the dessert and mountains at night–it is possible, so long as the trail is well trodden. I guess this is one of the main reasons why we need the Church–the well-trodden pathway to Christ. St. Mary of Egypt gave herself completely to God and thus experienced tremendous Light, and as her mind healed, was able to live in the desert with God and without any direct, physical contact with the Church for 37 years (or was it 47, I don’t remember). I, however, hold back so much. I fear so much. Except for brief moments, my mind is a busy intersection of thoughts going this way and that. It would not be comely for God to shine the riches of His Grace too brightly on me. But I don’t despair. I have a well-trodden path to follow. I have enough Grace to see what is before me today: to say my prayers today, to control myself today, to manage my schedule so that I can go to Church on Sunday to receive the Precious Body and Blood of Christ. One day at a time, one step at a time, through the prayers of our Immaculate, Most Blessed, and Glorious Lady Theotokos and Ever Virgin Mary and all of the Saints. One day at a time. St. Isaac speaks of other ways our spiritual vision is obscured. Passions, he says, are like dark objects or clouds that come between the Grace of God and our minds (our spiritual eyes). God may be pouring out His Grace abundantly on us, but because of our passions, we cannot see a thing. 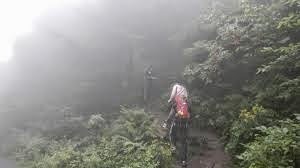 I have hiked mountain passes that were shrouded in fog so thick that you could barely see your own feet–a dangerous state of affairs when the wrong move can send you plummeting several hundred feet. This is what the passions do to us spiritually. God may be giving us all of the Light possible, like the midday sun, but our passions shroud us like a thick fog and we make stupid mistakes and are easily seduced off the trail to our own (and other’s) hurt. Another factor affecting discernment is ability. That is, just as people with healthy eyes still have different abilities, so people with healthy minds still have differing abilities (remember, St. Isaac is writing in the 7th century, before anything was known about lenses and how the eye actually works). There are one talent, two talent and five talent minds. Not everyone has the same capacity for spiritual discernment. What’s important is not how much or how little one sees or knows in their hearts. What’s important is what they do with what they do see and know, how their knowledge of God leads them to repentance, how their knowledge of God leads them to surrender everything–rather than trying to save their own life like the servant who buried his talent because he was afraid. Other factors that influence one’s discernment are “the hinderances of times, places, and means.” This is referring, I think, to the seasons and circumstances of life. A parent raising small children is laying down her or his life in an very Christ-like way, but not in a way conducive to developing the inner life and prayer to a large degree. It is a season. It is a season during which desire and longing can build so that when the season changes, longing and desire will lead you into the life of prayer that you have been longing for. But even as a busy parent (or business person or auto mechanic or school teacher or nurse), just the longing itself and the mere desire for prayer and peace and stillness have a wonderful way of creating opportunities even in the midst of the zaniness, like a quiet park in the middle of a city. The inner hermit in the cell of your heart can pray even while the “wild beasts” roar around you. There are other factors too that St. Isaac mentions affecting our ability to develop the knowledge of God. A weak will, the lack of a spiritual father or mother, a disposition (temperament or personality) not suited for spiritual pursuit. None of these are unchangeable conditions. God’s in the miracle business. But we all have to begin where we are, with the limited ability and Grace we have, to seek to know, to long to know, to strive to give our lives to God. If we do our part, God will take care of the rest. If we follow what we know, maybe God will reveal to us some of what we do not know. Thank you, Father. Much food for contemplation.